The Movement for Natural Regeneration (MONAR), Ghanaian environmental organisation dedicated to the promotion of Farmer Managed Natural Regeneration (FMNR), has been officially recognised by the government of Ghana as a national NGO. 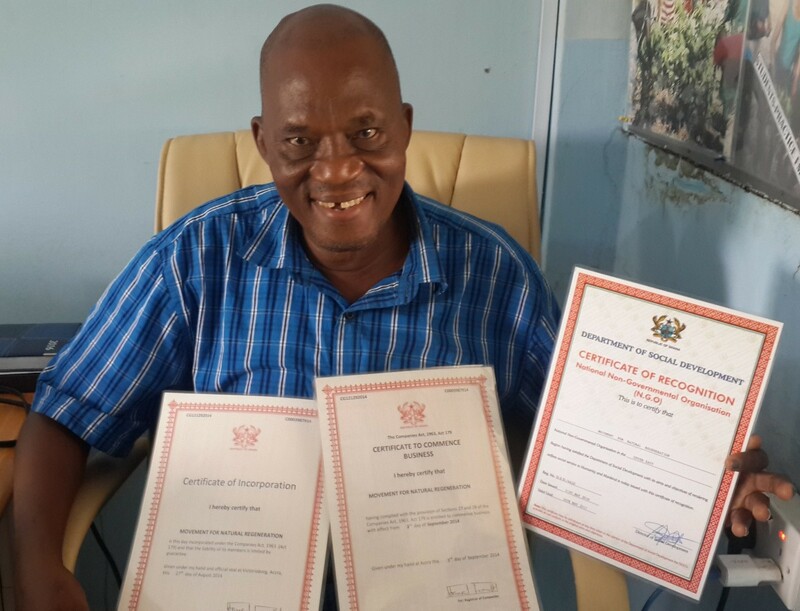 On Thursday June 9, 2016, MONAR received its certificate of recognition as a national Non-Governmental Organization from the Department of Social Welfare of Ghana’s Ministry of Employment and Social Welfare, barely two years into its existence. The Constitution of Ghana guarantees freedom of association, permitting the formation of voluntary organizations and other civil society organizations (CSOs). However, CSOs, including local and international NGOs, must be registered or incorporated under the Companies Act 1963 (Act 179), and with the Department of Social Welfare if they wish to enjoy the benefits of having a legal status, or the limited tax advantages that may be available. Announcing receipt of the certificate to the FMNR Hub of World Vision Australia on Friday, June 10, Norbert Akolbila, founder and Executive Director of MONAR said he was overwhelmed with joy for this great achievement in the short life of his organization saying “it will spur me and my team to work harder to fulfill the aims and objectives of MONAR”. He said MONAR got this recognition through hard work, commitment and perseverance since the requirements for the certification were stringent and laborious. He thanked its local and international partners like the FMNR Hub and World Vision Australia for their support to the organization. He also paid glowing tribute to Tony Rinaudo, pioneer of FMNR and his team at World Vision Australia for their support. Norbert said MONAR is now poised and ready to collaborate with other partners in order to reverse the rapid land degradation in the Savannah dry lands of northern Ghana through the widespread scaling-up of FMNR and other sustainable land management practices. He said addressing the complex problem of land degradation requires the collective efforts of all from the local to the international levels. MONAR was founded in August 2014, with the main objective of promoting the widespread adoption of FMNR as a simple and cost effective technique for re-greening degraded land in Northern Ghana. This is done through social mobilisation, advocacy and nurturing genuine partnership. MONAR is commitment towards building partnerships with local communities, government and non-government agencies and other civil society organization towards achieving its objectives.